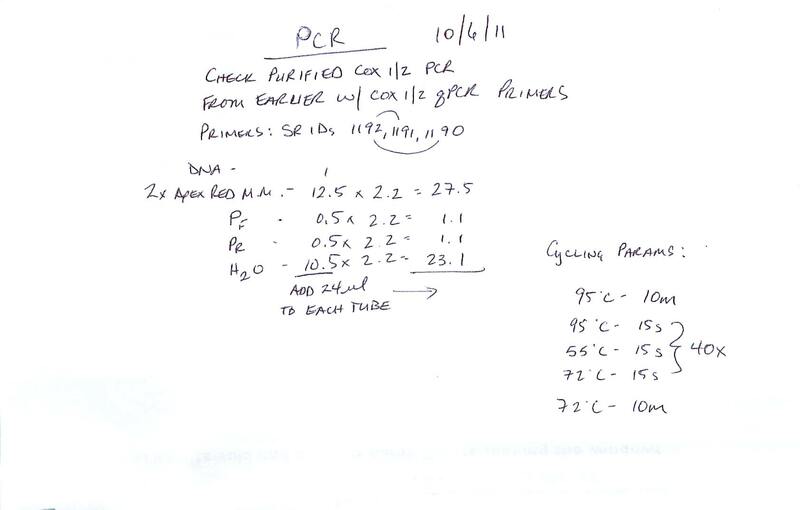 This entry was posted in Miscellaneous and tagged COX, cyclooxygenase, PGS, plasmid isolation, prostaglandin synthase, QIAprep on 13 October, 2011 by kubu4. This entry was posted in Miscellaneous and tagged colony screen, COX1, COX2, Crassostrea gigas, cyclooxygenase, gel, Pacific oyster, PCR, PGS1, PGS2, prostaglandin synthase on 13 October, 2011 by kubu4. This entry was posted in Miscellaneous and tagged bacterial transormation, COX, Crassostrea gigas, cyclooxygenase, kanamycin, Pacific oyster, PGS, prostaglandin synthase, TOP10 cells, TOPO TA Cloning, X-gal on 12 October, 2011 by kubu4. This entry was posted in Miscellaneous and tagged COX, COX1, COX2, Crassostrea gigas, cyclooxygenase, gel, Pacific oyster, PCR, PGS, PGS1, PGS2, prostaglandin synthase on 6 October, 2011 by kubu4. This entry was posted in Miscellaneous and tagged COX, COX1, COX2, Crassostrea gigas, cyclooxygenase, gel, gel extraction, Pacific oyster, PCR, PGS, PGS1, PGS2, prostaglandin synthase, Ultrafree-DA on 6 October, 2011 by kubu4. 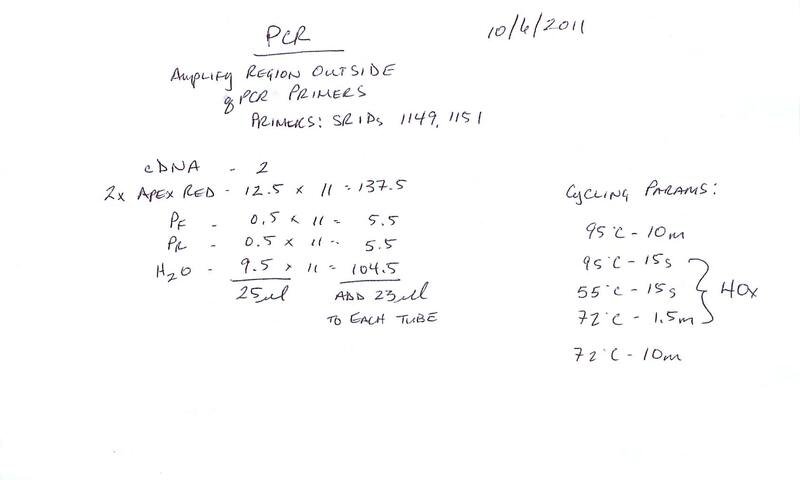 Sequencing results received 20110801. SJW15 and 16 apparently stop abruptly. The sequencing facility believes this to be caused by secondary structure of the template. Depending on how things align, I may consider using 7-daeza-GTP in a PCR reaction and re-sequencing this clone, as the 7-daeza-GTP helps relax secondary structure. Spoke with Steven and he suggested just designing new primers closer to each other and resubmit. This entry was posted in Miscellaneous and tagged COX, COX2, Crassostrea gigas, cyclooxygenase, Pacific oyster, PGS, PGS2, plasmid idolation, prostaglandin synthase, QIAprep, Sanger sequencing on 28 July, 2011 by kubu4. Inoculated 4 x 5mL 1xLB + Kan50 with a colony from each set of clones, incubated 37C, 200RPM, O/N. Will mini prep and send for sequencing tomorrow. This entry was posted in Miscellaneous and tagged bacterial culture, COX, COX2, Crassostrea gigas, cyclooxygenase, kanamycin, Pacific oyster, PGS, PGS2, prostaglandin synthase on 27 July, 2011 by kubu4. Performed colony PCRs on the 4 sets of cloning reactions that were performed yesterday using the M13F/R vector primers. 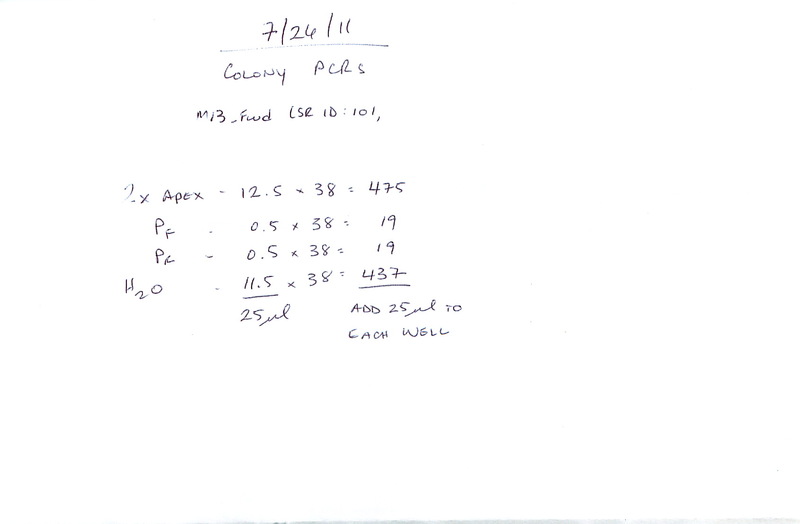 Colonies were picked, restreaked on a fresh LB Kan50 plates (made 20110726 by SJW) and PCR’d. Master mix calcs are here. Selected 8 white colonies from each cloning reaction for PCR. Restreaked plate was incubated @ 37C O/N. Hyperladder I is used as the ladder in both gels. Cloning results look great (except Colony #1 in the 5′ Top Band didn’t produce a product). Will select a re-streaked colony from each set and inoculate liquid culture for mini prep and subsequent sequencing. This entry was posted in Miscellaneous and tagged colony screen, COX, COX2, Crassostrea gigas, cyclooxygenase, gel, Pacific oyster, PCR, PGS, PGS2, prostaglandin synthase on 26 July, 2011 by kubu4.